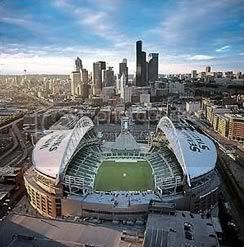 Unfortunately, last evening's thrilling 2-1 Rhinos win in Seattle versus the Sounders took place way past my bed time. So, I was unable to feel downtrodden when Matthew Delicate missed high on a pretty wide open net. I was unable to get the rush when Delicate got the Rhinos on the board in the 70th minute. I was unable to say "Here we go again!" when the Rhinos conceded a 75th minute goal off of a corner kick. And I was unable to have the joy of celebrating Greg Howes' 50th USL goal as he cleaned up a misplay by the Sounders' keeper in stoppage time to keep the Rhinos perfect through 4 games in 2006. So rather than try and fake it, I'll just point you off into the far reaches of cyberspace and allow others describe what went down in Seattle last evening.